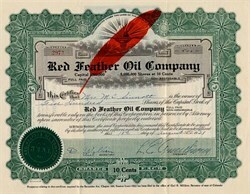 Beautiful certificate from the Red Feather Oil Company issued in 1930. This historic document was printed by Goes and has an ornate border around it with a vignette of a large red feather. This item has the signatures of the Company's President and Secretary and is over 78 years old. We will always maintain our founding commitment to customer satisfaction and the delivery of an educational product with an enjoyable shopping experience. Please let us know how we may be of service to you. 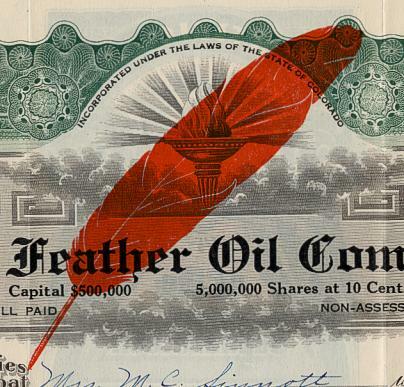 Note: All Old Stock and Bond Certificates are actual authentic certificates and are sold only as collectibles. We do not sell reproductions and offer a lifetime guarantee to the authenticity of everything we sell.